Chocolate Fountains have become an absolute "must have" at events. Chocolate Fountains of South Florida provides the most sought after chocolate fountains in the special events industry for weddings, bar/bat mitzvahs, corporate affairs and other catered events. Imagine a fountain where rich Belgian chocolate is melted from below and then carried to the top where a flowing curtain of delicious warm chocolate cascades down the fountain tiers like a chocolate waterfall. The chocolate fountain is available in dark, milk and white, and the dipping items are endless. 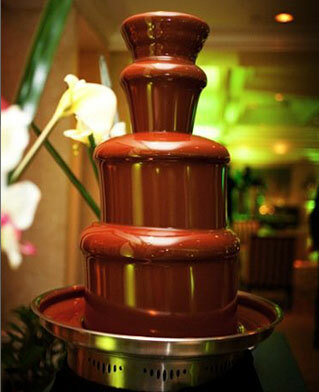 Chocolate Fountains of South Florida will customize your event. 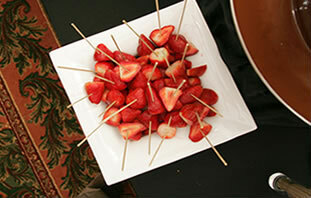 The personalized service happens from the moment you book your event to the last strawberry that is dipped. 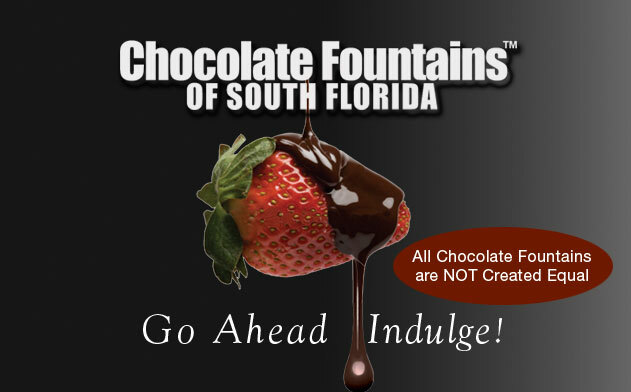 Chocolate Fountains of South Florida is a full service company. They allow you to sit back and enjoy your special day. The professional chocolatiers will set up the fountain to ensure a smooth chocolate flow. So think beyond your traditional Viennese table and indulge yourself in the most decadent chocolate experience ever! Having Chocolate Fountains of South Florida at your next event is an absolute “must have.” Serving Dade, Broward and Palm Beach County. We pride ourselves on exceeding our client's expectations. We look forward to customizing your next event.